Tales … of Bats and Belfries! Born in 1952, Andrew learnt to ring at the age of 10 at Eastham in Cheshire. Whilst serving as Tower Captain, he rang his first Quarter Peals. Upon entering University, he rang his first Peal with the Manchester University Guild in November 1973. Moving to Wootton Bassett in Wiltshire, he became Tower Captain. It was there that he met and married Joanne, a ringer from Dorset, who had had her first teaching post in the town. The next move was to Buckingham where his two daughters were born. Finally the family moved to Fairford where he was the Steeple Keeper. He was also responsible for the ringing at Meysey Hampton. He joined the Guild in November 2011. He took an active part in the activities of the Guild, regular ringing at the Saturday evening practices. Lately he was also able to take part in the monthly tours. Not a prolific Peal ringer, he enjoyed Quarter Peals and during his later years took up Tower Grabbing . The funeral of Andrew Roberts will be on Monday 11th January at 1:45pm at Cheltenham Crematorium followed by refreshments at Fairford Community Centre. If you cannot make it to the crematorium please feel free to join us at the Community Centre at 3:15pm. Andrew requested guests to wear smart casual clothes; he would not have worn a tie, so you don't have to! Please let Wendy Graham know if you plan to attend the refreshments 01285 711765. You can e-mail me regarding numbers for refreshments if that is easier (administrator@horcott.demon.co.uk). There should be open ringing during the refreshments as well. New Year's greetings to all. I hope your ringing in 2016 will be enjoyable and successful. The Church of England is entering a phase of great change. Some of it will affect us. You will see from 'The Chaplain's Thoughts' there are likely to be significant changes for churches with small congregations, that some may become 'Festival Churches' with far fewer Services. As Peter suggests, the need for bells at such churches will therefore decrease greatly, but he highlights the need to ring the bells when Services are held – and encourages us to ensure this happens. Also, too, where such a church lacks a steeplekeeper, those who are able should arrange with the PCCs to look in occasionally to check over installations, otherwise birds may enter and create a truly filthy mess in a very short time. While there, a check over of ropes and other wearable items is a good plan. The PCCs of Festival Churches are likely to be very short of money, so any voluntary assistance we can give will, I'm sure, be gratefully received. Non-ringers can't do what we can do. Additionally, the faculty rules will have changed by the time you read this. What you can do to bells without permission and what you can't do without permission. You might not be a steeplekeeper or an occasional maintainer of bells, but you ought to be aware of the new Rules in case someone suggests things are done to your bells that doesn't comply with the new law. Your PCC will be pleased if you know something about it. See New Faculty rules. John Kinchin's recent experiences in visiting towers to ring on Sundays is significant – and I guess it's happened to most of us: insufficient ringers. It certainly has to me. Mickleton is indeed fortunate to ring as often and as fully as they do. There are other towers around that manage similarly, but very few compared to those that don't. 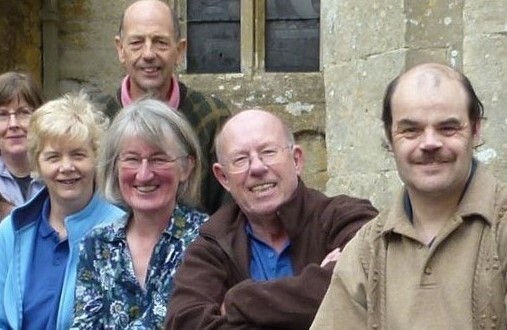 Peter Newing's plea to ringers to visit Festival Churches (if such occurs) occasionally is well made, but we shall need to organise ourselves so that we have a rota to visit other towers on a regular basis to ensure bells are rung at least once a month. Yes, it will mean devoting more time in some cases to the amount we ring now, and also accepting that it will cost something to travel to various places, but I think we should 'give something back' to an activity we enjoy - and costs us little. Another 20-pager hits the streets, with contributions from all the four Shires this time (and I had to carry bits over to April, too) Wonderful. It is said the Church of England now has more Churches facing closure, especially in the countryside in rural Dioceses. The Bishop of Worcester, the Right Reverend John Inge, has recently published a report It recommends that parishes which have fewer than ten regular worshippers might like to become 'Festival Churches', which means remaining open, but only having, say, four Services a year at such times as Christmas, Easter, Harvest Thanksgiving and Remembrance Sunday. They would be open for Christenings, Marriages and Funerals when needed. 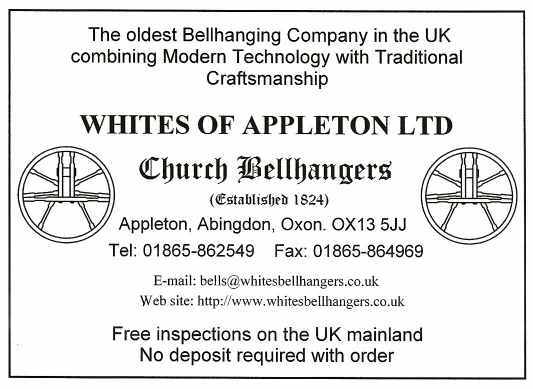 What is important for bellringers is that ringers in the area, who are probably already peripatetic, try to make sure that they ring the bells when a Service is held, but this might be difficult at Christmas and Easter when all Churches have Services. We all see small congregations at the Churches at which we ring, and it is easy to conclude the CofE has to introduce changes before much longer. From what I can deduce, the Report is effectively suggesting a half-way house between a church remaining fully open for Services every Sunday and the other end of the scale, the Churches Conservation Trust (CCT) approach, where the Churches it owns and cares for are effectively mothballed but are still places of worship. An example of the latter is Saintbury, which is open most days and a small handful of Services are allowed to be held. However, the CCT owns these Churches and they alone give permission for all activities, including ringing, that occurs within them. The Report seems to suggest a similar mothballing regime, except that the PCC retains ownership – but the PCC will also retain the costs of maintenance and the cost of running the Services. Unlike most CCT Churches, weddings, baptisms and funerals may still occur at Festival Churches, and the fees for such will presumably go the PCC – which, again presumably, will still have to pay a quota to the Diocese, but this may be reduced in-line with the reduced use. 1) The Minutes of the Aug meeting were agreed. Guild Xmas Party: Stuart reported all arrangements finalised for Badsey Church on 12th Dec after the early-start practice. It was agreed to donate £25 to Badsey for the use of the Church. Treasurer: Michael D presented his report: no comments and accepted. CCCBR: Chris said three items of interest had appeared recently: 'Festival Churches' (see Chaplain's Thoughts: Ed), new Faculty Jurisdiction Rules for bell maintenance (see following article: Ed), and CDM Regulations that involve major bell work (see p.10. Ed). PillertonHersey: funds for this rehang and augmentation project are about half-way. The redundant bell from Adlestrop will go to this project to augment to 4. AGM & Striking Comps: agreed as a very good event throughout. Q peal day or weekend: to be decided. Guild Accounts Examiner: Chris reported that Robert Hall was willing to take over from Mike Fairfax, who announced his resignation at the AGM. Agreed nem con. John C asked whether another pig roast event could be staged. 8) Next Meeting: Tues 17th Feb 2016. Future Committee meeting dates: 17th May, 16th Aug, 15th Nov .
A new Church of England law has been passed in Parliament and it will become applicable in all dioceses from 1st January 2016. It is the Faculty Jurisdiction Rules 2015. It covers work to all aspects of a Church, and this includes bells. It is an English law and those that undertake work within churches need to know and understand what it says, otherwise penalties can be applied to those who transgress (as has always been the case with the current Ecclesiastical laws). This article concerns only work to bells. It is aimed at those who undertake such maintenance work. The current Ecclesiastical laws have always contained clauses that allow bell maintenance to be undertaken without seeking permission from the Diocese. These clauses were usually known as 'de minimis', or more latterly Minor Matters. At present each diocese has its own de minimis clauses, some of which allow more work than others. The basic allowance is something like 'oiling, greasing and replacing stays and ropes' with appropriate tightening where required thrown in. If anything beyond de minimis is required, then permission from the Archdeacon must be sought. Major work requires a faculty. The new law will provide consistency across the dioceses – and the new law kicks in now. It is therefore sensible to be aware of how it will affect bell maintenance from the start. Now, I understand how some steeplekeepers will feel: “They're 'my' bells and I do everything that's necessary to keep them in good condition, and I shall continue to do that regardless.” Yes, I'm a steeplekeeper, too, but we steeplekeepers look after the bells on behalf of the PCC, ie the legal owners. We can put the PCC in the dock very quickly if we do something we shouldn't, particularly if it has a permanently damaging effect on the bell. Fire and brimstone might then be the least of our worries! This guidance is given by the Church Buildings Council to all parochial church councils. From 1st January 2016, it will be possible to carry out a range of works to bells without a faculty: see List A and List B in Schedule 1 to the Faculty Jurisdiction Rules 2015. Carrying out works in List A or List B is subject to conditions set out in the list. It is a condition of carrying out any works to bells under List A or List B that regard is had to this guidance. Additionally, in the case of List B works, the approval of the archdeacon must be obtained before they are carried out and the archdeacon may apply additional conditions. In the Schedule to the Faculty Jurisdiction Rules the word 'rung' in the phrase 'in a fit condition to be rung' should be given its ordinary English meaning, rather than a technical meaning. It is therefore always to be understood in context. This means that if a bell is set up for full circle ringing, it has to be in a fit condition for that. If a bell is set up for chiming, it is to be in a fit condition to be chimed using the mechanism provided. Because of the diversity of work to bell installations there will always be anomalies where the works proposed do not fit comfortably into either list. Where this is the case then the parish should contact their Archdeacon who will seek advice from the DAC/Bell Adviser and advise if a faculty is required or not. When work to bells has an impact on a turret clock the DAC Clock Adviser should be consulted. The works in List A may be undertaken without faculty and without informing the Archdeacon. They are to allow for the routine maintenance and inspection of bells that are in regular use and where there is a tower captain, or other person, who has sufficient skills and knowledge to ensure that the work is done with due regard to Health and Safety and the protection of historically significant parts of the installation. List A is not appropriate for work when a bell needs to be lifted from its bearings or for making alterations to an installation. Regular visual inspection of the belfry and regular removal of any debris that may be carried into it is vital for the safe and long lasting operation of the installation. It is good practice to only visit the tower when there is someone else present in the church and always to notify someone that you are inspecting the bells and when you expect to complete your work. If necessary training in belfry maintenance is available from the Towers and Belfries Committee of the Central Council of Church Bell Ringers (www.cccbr.org.uk). The bell trade occasionally runs training events on maintenance and will normally be pleased to offer advice in this area. It is appropriate to consider putting a contract in place for maintenance, especially if no one is available locally with the necessary skills and experience. Works in List B require the Archdeacon to be consulted and they will take advice from the DAC and its bells adviser before giving notice that the proposals may be undertaken without a faculty, or advising that they require a full faculty application. As with List A These works should only be carried out by persons with sufficient skills and knowledge to complete the work to a satisfactory standard, with due regard to Health and Safety and the protection of historically significant parts of the installation. This may require a bellhanger to carry out or oversee the works. Although a series of relatively minor works may be all that is necessary to bring an installation back into use, the provisions of List B are principally for bells in regular use. If an installation is being brought back into use after a period of over 5 years a professional bell hanger must be consulted to see that all aspects of the ring are fit for use. List B cannot be used for works that require the removal of the bell from the belfry or for works that involve drilling, or other work that would make a lasting change to the bell. When a wrought iron clapper is replaced with one of a different material, it is good practice to retain the original clapper in the tower. 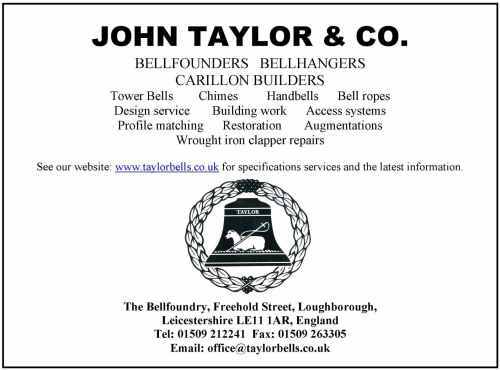 (1) The inspection and routine maintenance of bells, bell fittings and bell frames. (2) The repair and maintenance of clappers, crown staples (including re-bushing) and bell wheels. (3) The repair or replacement of bell stays, pulleys, bell ropes (including in Ellacombe apparatus), rope bosses, sliders or slider gear. (4) The repainting of metal bell frames and metal bell fittings. (6) The introduction of peal boards in a location not normally visible to the public. If you are a steeplekeeper or an occasional maintainer of bells, there should be sufficient above to convince you it does apply to the tower and bells on which you are working, and that it is necessary to comply with the Rules. I hope so, because it is the law as it applies to Church of England churches from 1st January 2016 (ie before you receive this Newsletter). The AGM & Striking Comps at Pebworth came and went and what an excellent day it was! I think it was one of the best we've had for some time. Not only did we have a Brazier Trophy competition, something that's not been run for 2 or 3 years, but we had three teams competing. In addition, the Newing Shield competition attracted four 'real' teams, ie no scratch teams involved. The Guild Service was also a delight, with a goodly number of members attending. Our thanks go to the Rev Debbie Forman for conducting it; and to her husband for playing the organ. Debbie and Martin Penny are to be thanked, too, for allowing us to use the bells; and how useful it is to have Pebworth bells back in operation again. Lastly, the AGM itself was held in the Village Hall and it was good to have in excess of 30 members attending. The tea and eats were, as usual, very welcome, and thanks go to Stuart and Michael Cummings for master-minding the domestics, and to Stefanie Whittle and her kitchen staff for undertaking the serving duties. There was one non-member who worked very hard from what I could see, and that was Eliza L-S. Thank you Eliza; your efforts were very much appreciated. Who won the Newing Shield? Guess. Mickleton of course - and they won it in very fine style, too. They produced a lovely piece of ringing that everybody knew was going to win. Hearty congratulations to them. These longstanding winners of The Newing Shield will go down in the Guild's history as a band genuinely 'of distinction'. The judges said they took the bells at a leisurely pace, no rushing and tearing about,– and quite obviously there's nothing wrong with that. The line-up of Guild Officers and Committee did not change, although one position other than those did. Mike Fairfax, long-standing supporter of the Guild who has served it in many positions including Guild Master, decided not to continue as one of the Accounts Examiners. Thank you Mike – and rightly an Honorary Life Member of the Guild - for all the work you have done as an Accounts Examiner and all the other time and effort you have given the Guild in other positions over so many years. It is hugely appreciated. 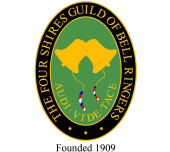 The Annual General Meeting of the Four Shires Guild of Bell Ringers was held on Saturday 17th October 2015 in Pebworth Village Hall following the Striking Competitions and the Guild Service held at St Peter's Church. The President, John Nicholls, was in the Chair. Members attending numbered 33. Handouts of the agenda, Minutes of 2014 AGM, Guild accounts, Guild Master's report were available (all had appeared in various Guild Newsletters during the year). 2 Minutes of the Last Meeting: The Chairman asked whether these Minutes may be taken as read, to which agreement was given. No issues of accuracy were raised. The Minutes were accepted as a true record and were signed as such by the Chairman. 3 Matters arising: There was none. 4 Guild Master's Report 2014-2015: appeared in the October Newsletter and was taken as read. Nothing arising: accepted. 5 Treasurer's Report: The Guild accounts to 31st December 2014 appeared in the April 2014 Newsletter and were taken as read. Since appearing in the Newsletter they have been examined and nothing of note was discovered. Michael Dane proposed and Chris Povey seconded that the accounts be adopted. The proposal was carried. The Examiners are to sign the formal copy. Roger Hunt asked how many members the Guild had at present. The Secretary said the recent Newsletter distribution list indicates about 215. Guild Master: Richard Lewis-Skeath proposed and Michael Haynes seconded Peter Quinn, who had indicated his willingness to stand again. There being no other candidates, Peter was re-elected. Ringing Master: Freda Cleaver proposed and John Carroll seconded Richard Lewis-Skeath as Ringing Master. There being no other candidates, Richard was re-elected. Secretary: Michael Haynes proposed proposed and John Carroll seconded Chris Povey. There being no other candidates Chris was re-elected. Treasurer:Anita Harrison proposed and Martin Penny seconded Michael Dane. There being no other candidates, Michael was re-elected. Accounts Examiners: Mike Fairfax had indicated that he did not wish to continue as Accounts Examiner. Nothing to this effect had been received from Trevor Hobday, so it was assumed he was happy to continue. Offers to fill this post were invited, but there were no takers. Martin Penny asked why the Guild has two Examiners, as he examines as a single Examiner accounts with greater turnovers. The Guild has two Examiners, as it is in the Guild Rules. He proposed the Guild consider having just one; seconded by Anita Harrison. On a show of hands, about 15 members were in support. The Committee will consider this as a way forward if no second Examiner can be found. Such will require a formal rule change. Sally Austin asked what the position was with the three Oxon towers thought to be charging to ring there. The Sec and Stuart Cummings confirmed it was only Kingham that was charging and that visits to Chipping Norton and Churchill were to be investigated. Nick Allsopp suggested the Guild has a quarter peal day or weekend and proposed such. Richard Lewis-Skeath seconded. To be arranged by the Ringing Master. Stuart Cummings thanked all those who brought food for the tea, and thanked Stef Whittle and her team for all the hard work in the kitchen. The Merit Award was awarded to the Pebworth team. The Meeting closed with the Chairman thanking the Church authorities and the judges, and those resigning members for their time in post. These Minutes are subject to final acceptance at the 2016 AGM. 3rd, Wellesbourne: Peter, John C, Chris P, Sue, Michael D, Simon. There was no meeting between that of 27th October 1915 (reproduced in the last Newsletter) and 7th April 1916. Committee Meeting held on Thursday 3rd February 1976 at The Barley Mow, Chipping Campden. Members attending: H O Hart (Chairman), A J Brazier, P S Carter, M F Fairfax and G Osborn. Minutes of Previous Meeting: Minutes of Previous meeting held on 4th February 1975 were read and agreed, and signed by the Chairman. Matters Arising: i) Courses. No further progress had been made; ii) Competition Judges. It had not been possible to arrange for judges from the Oxford Diocesan Guild, Members of the Coventry Diocesan Guild had agreed to assist following an approach by M F Fairfax; iii) Honorary Guild Chaplain. At the Annual General Meeting Revd J D E Smith was elected Vice-President of the Guild and it was agreed that he should be invited to attend future Committee Meetings. OffenhamRinging: The Secretary reported on correspondence in the 'Evesham Journal' concerning complaints by an Offenham resident, and the action taken was approved. Accounts: Accounts for the year ending 31st December 1975 were presented by the Treasurer, previously having been audited by the Guild Master. These were approved and recommended for acceptance by the Annual General Meeting in October. Bank, etc, Accounts:It was agreed to arrange the necessary banking accounts, withdrawal signatures to be two from H O Hart, M F Fairfax and A J Brazier. Membership: The Secretary reported members at 31st December as follows:fifty three Residential Members, seven Extra Terrestrial follows: Members – 53, Extra Terrestrial Members – 7, Honorary Members - 13. Dinner Arrangements: These were discussed generally and agreed. Revd L Powell, Vicar of Quinton, to be invited to present the Silver Cup and Competition Certificates. Outing: The Secretary suggested an outing on Saturday 8th May with tower bell ringing during the morning and afternoon, and attending the Handbell Rally at Leicester in the evening. It was agreed to obtain the views of members on this matter. Ringing Competitions 1976: It was agreed to leave the arrangements with Michael Fairfax. If possible, towers to be those used in the 1926 competitions and judges from the Oxford Guild. Badges: It was agreed to obtain the views of members to obtaining a suitable badge at a cost of £1-00 each. Should these prove favourable, designs could then be presented at an Annual General Meeting. Next Committee Meeting: To be arranged for March. 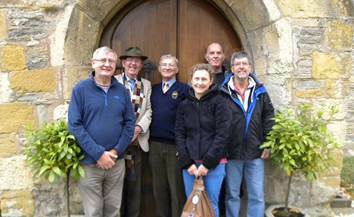 The Four Shires walking and ringing tour, organised by Michael Haynes (to whom thanks. Ed) took place on Saturday 26th September 2015. 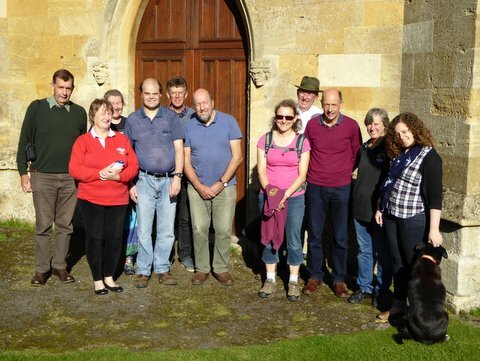 We met at Whichford (8,13cwt), where we rang from 10.00-10.45am. At this point there were eight ringers: Michael Haynes, Peter Kenealy, Stuart and Michael Cummings, Alison Merryweather-Clark, Sue Bacon, John Carroll with Molly the dog, and Jane Gilbert. The following methods were rung: Winchendon Place Bob Doubles, Cambridge Surprise Minor and Grandsire Triples. Four of us then walked from Whichford to Cherington Church (6,6cwt), where Morris's 240 of Grandsire Doubles was conducted by John Carroll. We rang some plain courses of Stedman Doubles and then St Martin's and St Simon's Spliced Doubles, again conducted by John Carroll. After that four of us went to the Cherington Arms pub for a well-earned lunch; and Molly the dog came, too. After lunch, four of us, plus Molly, walked from Cherington to Great Wolford Church (6,12cwt) where the others, plus the Murphy family, were waiting. The extra ringers allowed us to ring a variety of methods and we managed plain hunt doubles, Kent Treble Bob Minor, Cambridge Surprise Minor, St Clement's College Bob Minor, Stedman Doubles, and St Simon's and St Martin's Spliced Doubles. After photos of the group were taken here, four of us walked back to Whichford, where our cars were waiting. A very enjoyable day was had by all. The heading above was that used by my illustrious predecessor, Pam Copson, in 1994, for an article I wrote for the Newsletter about a visit to the French bellfoundry of Cornille-Harvard situated at Villedieu-les-Poêles on the Cherbourg peninsular. 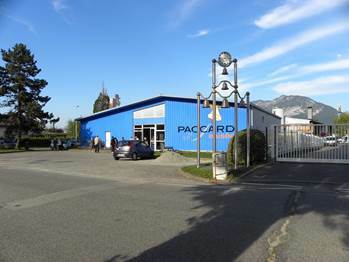 There are two bellfoundries in France and a tour in our campervan last September around the southern and eastern parts of France allowed me to visit the other one, Fonderie-Paccard, which is situated a few kilometres south of Annecy. A foundry was established in 1796 by Antoine Paccard, and the business has continued through seven Paccard generations to the present. We entered the entrance to the museum and were greeted by a very pretty lady, who spoke impeccable English. She told us a tour had just started and that we could join it if we wished, but it was in French if we didn't mind. OK, we'd pick up the odd word — possibly. I did hear 'Anglais' in the commentary and was told later that this was a mention of John of Arc, who was burned at the stake by the English — oh, Les Anglais! After this we entered a small cinema for a film about the casting in 1998 by Paccard of The World Peace Bell, 33 tons in weight (that's not a misprint: 33 tons) for a location in Kentucky, USA. Again, this was in French, but the visuals were excellent and made up for a lot. Seeing the 'beginning to end' of such a large bell was fascinating. It is a swinging bell. Helen and I had been promised another film, in English this time, about the casting in 1986 of three large bells for Toronto. These were 19 tons, 10 tons and 6 tons. Big ones by any stretch of the imagination, but small compared with the 33 tonner. Again, this was an excellent film, and in some ways it was more interesting, because there was a greater concentration on the technical side of their bellfounding. After this we were given a tour of the foundry itself and our guide was the pretty lady from the museum. The lady was Madame Anne Paccard, wife of the technical director, Phillipe. Fonderie-Paccard use the 'lost wax' technique (as many continental founders do), whereby a false bell is either made in wax or coated with wax, to which all the external decoration (also in wax) is applied. The cope or the mould for the external surface is then constructed, after which the whole assembly is heated up to melt the wax. This leaves the cope with a beautifully smooth surface, which in turn gives lost wax bells their trade-mark very shiny finish. In most cases they are left golden; not blacked-up as here. English founders make their moulds differently, which doesn't involve wax coatings. 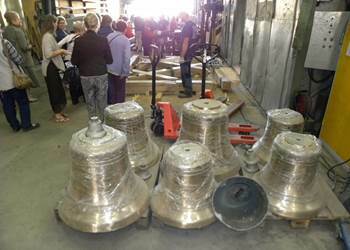 There were various newly-cast bells in the foundry awaiting delivery, including a 4 ton bell; and all were glistening in polished bellmetal (see photo). Very pretty. The museum has a small electrically-struck mini-carillon in the foyer. Anne Paccard is an accomplished singer. 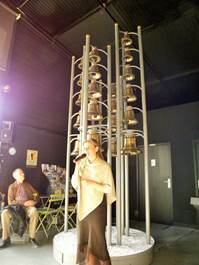 She demonstrated the quality of this carillon most effectively at the end of the tour by using it as an accompaniment. She sang various pieces for us, one of which was Edelweiss, sung in English. Whether this was for Helen and me I don't know, but the French people would know the tune if not the words. Anne Paccard has a superb voice; and the carillon was excellent. Afterwards Anne introduced me to her husband Phillipe, who also speaks impeccable English. Paccard produce mainly swinging/stationary bells and carillons, and have a number of major carillons to their credit worldwide. They and the English bellfounders are unlikely to compete unless large carillon work is proposed. Some Paccard bells have reached these shores, but only as a chime. St John the Evangelist's Church, St Leonards-on-Sea, Sussex, has four bells by G & F Paccard, dated 1891. There's probably an interesting story about how these bells came to be in the UK, but I don't know it. Thank you Anne and Phillipe for your hospitality. It was good to meet you; and we had an excellent time. PS: Anne told Helen the French equivalent of 'a pan' (as in, That bell sounds like a pan ) is 'une casserole'!! 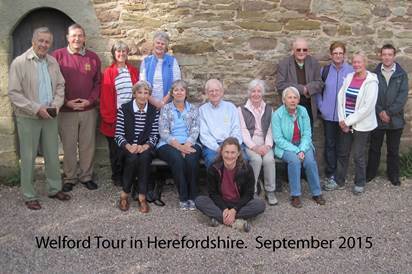 Fourteen ringers gathered at Colwall, Herefordshire, on Saturday 5 September for the start of the 2015 Welford tour, arranged by Freda Cleaver, Rosemary Cole and Ian Sturgess. St James Gt Church, (10 bells 10-1-5) stands about a mile outside the village amidst pretty country lanes and just to the west of the majestic Malvern Hills. When I first visited this tower nearly forty years ago on the way back from the Hereford ringing course, I remember a not terribly pleasing ring of eight. Wow, how times have changed! The bells I remember were thoroughly restored and augmented to ten in 1998 by Eayre & Smith and are now very pleasing to ring. Inside the ringing room, the visitor can still see remnants of the Seage's silent ringing apparatus, invented by Epaphrus Seage, an Exeter printing engineer in about 1875, which allowed ringers in years gone by to practise their craft without disturbing the neighbours. St John the Baptist, Eastnor (6 bells 9cwt) stands adjacent to a large green in the centre of the village, close by Eastnor Castle and home of James Hervey-Bathurst. The building is a mock 19thC or revival castle designed by Robert Smirke, the architect of the British Museum. Lunch followed at The Wellington, only a few minutes' drive from Eastnor church, on the main road between Malvern and Ledbury. The food and beer were excellent and a much welcomed opportunity to re-charge the battery in convivial company and surroundings. The first tower after lunch was All Saints, Coddington (6 bells 10-1-20), where the church is 13thC although the tower was rebuilt in 1865. The pleasing exterior of the church, with extensive views into Herefordshire made a lovely start to our afternoon's activities. The ringing room is bright and airy and the Taylor bells, cast in 1866, go very well. Fundraising for a complete refurbishment commenced 2001, which included a new steel frame and retuning, the work being eventually undertaken by Haywood Mills Associates and completed by September 2005 They are now an easy going six and allowed ringers of all abilities to enjoy some really good ringing. The bells, originally a six, including bells cast by Abraham Rudhall II and John Taylor and Co, were increased to eight with the addition of two new trebles in 2000. They all go well and sound very pleasing within the tower. Cradley proved to be most suitable tower to round off a pleasant days ringing in Herefordshire and our sincere thanks go to Freda, Rosemary and Ian for all their practical arrangements. Three intrepid Four Shires members crossed the border on 12th September to Shipton under Wychwood, on the other side. The purpose of this arduous journey? 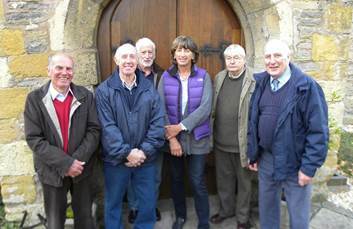 To help the locals celebrate the 900th anniversary of St Mary's Church by ringing a peal. This was the first peal on the bells for some 25 years to the exact day of the last one (actually 26 years: last one on 12/9/1989. Ed), and with the Bishop visiting the following day. There were also a number of notable firsts among the ringers present. No pressure there then! We started well, settled the nerves, then the conductor called stand at about 1/2 hour in, a missed call. Off we went again with some excellent ringing, until the last quarter where tiredness took its toll. We survived a couple of near fire-outs by the skin of our teeth and the skill of the conductor, and finally came round in a leisurely 3 hours 17 mins. Keith Murphy deserves a special mention for his admirable tenor ringing (not the easiest of bells) for nearly 4 hours (he was later to comment it was the hardest peal he had ever rung), as well as the conductor who guided us to a successful conclusion. We were greeted in the church by the rest of Shipton ringing community with most welcome refreshments and the odd beer to celebrate. Many ringers (if not all?) will probably have visited St Mary & All Saints' Church when visiting that lovely town of Chesterfield — best known for its crooked spire. Here was yet another opportunity for your scribe to take steps (literally — there is a 45-step spiral stone staircase to the ringing chamber) to ring on their ten bells (tenor 25cwt). This would be another 'First Tower' visit for me. An exploratory visit to the church on Saturday afternoon was of little help. The two 'welcoming' ladies (also manning the bookstall) confirmed they had bells. That was about it! Fortunately a gentleman standing nearby overheard the conversation, and advised that the Tower Captain was seriously ill in hospital. He suggested I arrive around 9.50am because they normally started 10-ish. Next morning I did as had been advised and on stepping into the church I was welcomed by the Sidesman, busily preparing hymn books, etc, for handout. He was a ringer, too, and appeared to be jack-of-all-trades at the church. He directed me to an outer door, from whence I climbed those 45 steps into a large, well maintained ringing chamber. I was greeted by the deputy captain, who quite frankly appeared to do all the necessary work involved, for example, he was going to fit the muffles in a fortnight's time for their Remembrance Sunday Service. We exchanged the usual campanological pleasantries while awaiting (hopefully) more ringers. The Sidesman/ringer then arrived (on time) and a fourth gentleman stumbled into the chamber, out of breath, at 10.05am. The bells needed rising — not a particularly good noise on a Sunday morning! Another ringer arrived some five minutes later (despite, he said, having had an extra hour in bed). A fifth bell was rung up individually. Thereafter we rang elementary call-changes and plain hunting — on bells that are in continuous demand from visiting bands. So here is yet another example of present day lack of ringers — a countrywide problem it appears. We really are fortunate at St Lawrence, Mickleton, to ring regularly all our eight bells for Sunday Services and special occasions — thanks to only three resident ringers and those joining us from nearby villages. Despite the very basic ringing, like that at the St David's Cathedral I wrote about recently, it was a very interesting and enjoyable occasion. 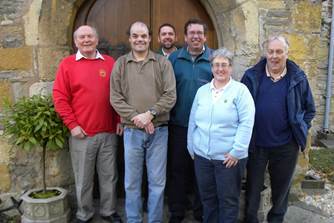 The Inter-Shire Trophy Competition took place on Saturday 21st November at St Edmund's Church, Shipston-on-Stour. 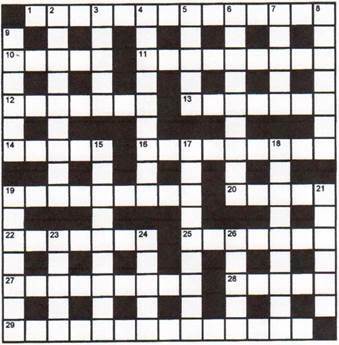 This competition, which alternates with the Minimus (Mini-Mouse) Striking Competition, is the one in which the Guild plays host to the striking competition winners of Oxfordshire, Worcestershire, Gloucestershire and Warwickshire. It may be unique in running such an event. Firstly, I have to apologise for a brief coverage of the event and the consequent lack of photos of the teams. I had intended doing all this, but immediately after the judging finished (I was the Worcestershire-nominated judge), I received a text saying a member of my family had been taken to hospital and I had to rush away. Teams this year came from Lillington (for Warwickshire), Faringdon (for Oxfordshire), Mickleton (for Gloucestershire) and Pershore (for Worcestershire). The teams assembled in the rear of the Church, which houses a very nice reception area with kitchen and toilets, ready for the draw. Len Morley masterminded the laying-out of the food that Guild members had brought — there was lots (to Bill's joy) - and the tea/coffee making. The judges, four in number, were bundled off into the North Porch prior to the draw at 2.00pm. Saturday was bright but cold, so, having been told in the morning the porch was to be where we would sit largely motionless, I wrapped up in the expectation we would have to fight a draught from a North wind through the door. As it happens, the porch wasn't such a bad place in which to be cocooned. The glass in the doors afforded ample light, and the doors themselves fitted well; draughts were insignificant. I've judged in much worse! The Competition itself is on Guild Competition lines, that is, rising and falling is included. While it might be usual to us, it is very unusual elsewhere (unless you are in Devon or Cornwall!). These two aspects were probably the biggest challenge to the teams — Mickleton excluded of course. When judging, you have the opportunity to concentrate entirely on listening to the bells. Yes, of course we listen when we are ringing, but we have to control the bells at the same time — and the bells sound different in the Ringing Chamber to that heard outside: perhaps louder or softer; perhaps harder to hear one or more bells among the others. The porch proved to be a good place to hear the bells. They all sounded even and at just the right volume. 1st Lillington (for Warwicksire) and were awarded the Inter-Shire Trophy. It is the Guild's custom in this event to announce only those teams in first and second place. Congratulations to the Lillington team; and to Mickleton, too, who I understand were surprised and delighted to have reached second place — but then we know they are good! The Guild's thanks go to all the teams taking part — we hope you enjoyed it — and to the Vicar of St Edmund's, the Rev Andrew Coleby, for permission to use the Church and the bells. Lastly, the Guild is very much on show to our visitors at this event and we are indebted to Len for managing so well the essentials of hosting, the food and the drinks, but of course this extends to all who provided food. The ringers' survey I mentioned in the last Newsletter has temporarily stalled. I guess it will restart early this year. The results should be interesting. 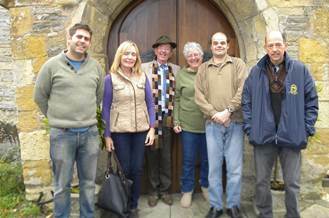 The Towers & Belfries Committee met at Evesham on October 31st. Although the business was fairly routine this time (except for advances in measuring the dynamic movement of towers while the bells are ringing, but I won't describe those details here other than to say this is being steered by a very clever person who works for the Building Research Establishment). The new diocesan steeplekeeping proposals, those not requiring permission and those requiring permission, were discussed. See New Faculty rules. One item was of particular importance: the Construction (Design & Management) Regulations 2015. 'What's that?' you might say. It's more usually known as the CDM Regs. It's part of Health & Safety legislation and controls responsibility for undertaking all types of construction work in this country. It's been around a long time, initially in 1994, and was updated in 2007 and then this year. The first edition of CDM excluded certain aspects of work, including bellhanging work, but the 2007 edition did include it — but it's fair to say the two major parties involved, PCCs as the Client and bellhanging companies as the Contractor preferred to 'look the other way' with any of it. The present edition of CDM, as from April of last year, is now very clear that work undertaken by PCCs — including bellhanging work — is included. Will this legislation involve the average ringer? The answer has to be 'no — but read the last paragraph of this article. If your church is considering professional work to the bells and you are involved with progressing such work, you need to be aware that CDM will apply (not could; it will). Don't let the PCC tell you differently. If they don't comply, the responsibilities for the various actions they need to undertake will automatically fall onto them, whether they like it or not. Also, the PCC should expect various items of paperwork from their chosen bellhanging contractor. Is this a new thing for PCCs? Yes and no. They are likely to have met CDM when undertaking other aspects of professional work around the Church. However, they are very likely to have been steered by the Church Architect in such cases. As it is rare for the Church Architect to be involved with bell work, PCCs have probably been encouraged to think such work does not apply. It does now. While CDM includes 'Regulations' in its title, please be aware it is a law and contravention can involve penalties. The Towers & Belfries Committee will be writing an Information Leaflet outlining briefly the requirements of CDM, and how it affects PCCs and contractors. This leaflet will form part of the collection distributed by the CC's Tower Stewardship Committee. Tales from a tower near you (6): … of Bats and Belfries! Following our visit to Dorsington (see last newsletter) just a mile or so away as the crow flies is the church of St James the Great at Long Marston with a large bell cast by John Rudhall in 1829. Refurbishment work here in 2012 required the bell to have its cast-in staple drilled out in the tower as the church organ pipes prevented the bell ( 32½" diameter) from being removed out of the vestry [my photograph shows the bell underneath the drilling table receiving attention]. It wasn't a comfortable environment to work in, with access via a cupboard with hardly room to clamber onto the ladder! The wooden floor above is split into two levels a few inches apart (enough to trip against frequently...) but the smell was the worst element to cope with as bats roosted there. All the walls were lined with plastic sheeting to try and keep the bat droppings from falling inside the tower and the plastic literally ran with bat urine. Fortunately the work proceeded quickly other than the realisation when delivering the drilling table (33"x36") that it too wouldn't get through the vestry doorway (I'll leave it to you to decide what happened then.......). There is also a small sanctus bell. Whoever said that the best ideas are always born in the pub after ringing (and also possibly after a few beverages have been consumed) was absolutely correct — at least in Hook Norton! We, of course, have an unfair advantage in that our village is home to a fantastic brewery and we were in the Brewery Tap at the time. So, having decided that we should enter again this year, we needed the “new idea”. This came in the form of an old bell wheel in Mick's garage and some plastic sheeting that had been used for signage and needed to be recycled. We just needed to find some greenery - kindly supplied by Tim. Thus “Ding Dong Merrily on high” was given new meaning. The festival itself was a great success — featuring 30 trees made by groups in the village. Creativity was at an all-time high and the event raised over £1000. Most importantly we had great fun conceiving and creating it! THE OCTOBER TOUR: THURSDAY 15TH (the 312th) AUTUMN GOLD. October, season of mists and mellow fruitfulness, saw us in Northamptonshire, a surprisingly rural county, known as The Cotswolds without the tourists (and prices!). First up Wilby a lovely 8cwt, anti-clockwise 6: ground floor, easy and light, albeit with a slightly shouty tenor. I just love it when history comes to life, and in Wilby Jenny Ball and Brenda Dixon are immortalised on one of the peal boards. An interesting take on bellringers rules hangs in the ringing chamber, as well as a wall sign for 'anti-climb' paint should anyone fancy trying! On to Higham Ferrers, 10, 22cwt. At 17, numbers were a bit depleted as we missed the Coventry contingent and a few others limiting what we rang here. Nonetheless we executed some very respectable Grandsire Caters. The ringing chamber was an open gallery, with a beautiful ornate church and lovely carved screens. These are a recently augmented 10 by Taylors, and were sublime. Worth the trip alone, just to ring on these - if only all bells were like this! A watchful owl on the windowsill had been relocated from the church roof as he failed to scare away the pigeons. Obviously doing good in the ringing chamber as no pigeons there. More history with Alan Marks and Brenda on another peal board, and some original wooden "Sally Jugs" hang on the wall, which used to whistle when the ropes passed through. A good value lunch at The Olde Victoria (no Cotswold prices here) conveniently near the church in Burton Latimer, where we were greeted by a splash of colour with winter pansies and fushias, and thoughtful heating in the ringing chamber, another balcony ring. Some respectable Cambridge & Plain Bob was achieved at this, sharp, crisp and easy to ring 10cwt 8. Finally on to Barton Seagrave, and here my notes run out as we were greeted by an open spiral staircase in the corner, which filled me with dread. It was modern and looked solid and I was assured quite safe, but fear defies logic. 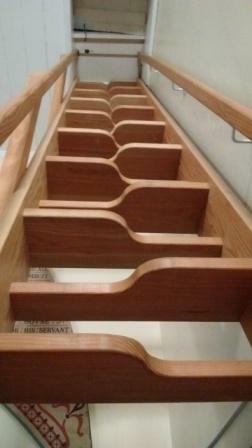 The open framework leads to open views across the height of the church as you climb. I was persuaded to go up, and then spent the next half-an-hour wondering how I was going to get down. I recall this is an anti-clockwise 8, which challenged our usual habitual ringing. Just for the record I did get down the stairs, with some encouragement and at least part of the way sat down, which seemed much more stable to me! Thanks to Jenny Ball for some exceptional bells, and an introduction to rural Northamptonshire on a lovely autumn day. It's little known that on November 19, Abraham Lincoln delivered the Gettysburg address and football player Pelé scored his 1,000th goal. Surely history does not have too many more interesting facts than these? Our goals on this particular day were to ring the bells at four splendid Northamptonshire addresses. Crick, to use words stolen from its online guide, is a village set in the pleasantly rolling countryside of Northamptonshire and yet close to good communications to major UK cities. We can vouch for the good communications as we were not unduly delayed in getting to our destination despite the November rain. After taking a peak at a delightfully skewed window in the church, we stomped up the cut-away safety steps using the correct leg for each step and through the trapdoor into the ringing chamber. During ringing, we did have some tower wobble which may or may not explain, or have some connection with the skewed window! The back bells in particular were to some degree odd struck but despite this, we managed some creditable Grandsire and Stedman Triples, a half course of Yorkshire and some call changes. Moving on to Braunston we found a church that was undergoing some urgent restoration work. According to the local paper, a piece of masonry crashed to the floor at the end of a Sunday service, just as the vicar was telling worshippers to 'Go in Peace'. The same paper described the church as 'The Cathedral of the Canals', an epithet that I suspect would be claimed by a number of churches across the country. This part of the world can certainly lay claim to be the 'safety stairway capital'. These unusual steps appeared again in Braunston. The bells were pretty good, none of the odd striking found at Crick, but they were very quiet. Quiet bells need quiet ringers so there were plenty of ssssshhhhh signs to be seen (but not heard). Heard outside by the general population of Braunston was Bob Minor, St. Clements, Cambridge, Beverley, Stedman and Winchendon Place. 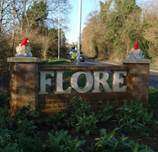 I've been to Flore before. This was our third address and it's got a great village sign in concrete that's only one letter away from being a well-known margarine. I also can't help feeling the font is similar, too. See what I mean! After we fought our way through what seemed like thousands of parents in 4x4's picking up at the nearby school, we rung Norwich, Bob Minor, London, Kent, Stedman, Cambridge and St. Clements. Never were so many entertained by so few, although we did number just over twenty for most of the towers. Our final address of the day was Weedon Bec. This is very close to Flore and the parish church of SS Peter and Paul is at the south of the village hemmed in and overlooked from both the Grand Union Canal embankment and the West Coast Main Line viaduct. According to Pevsner, it has a Norman west tower. The village is generally known as Weedon and has pretty much ditched the Bec (sorry!). By the end of the day ringers tend to get tired so a ground floor ring without any tricky safety steps was most welcome. 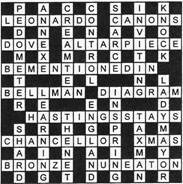 Methods were half courses of Cambridge and Yorkshire, Plain Bob Major, Stedman and Plain Bob Triples. Our thanks go to Jill and Mike Harvey from Weedon for arranging an event that sits well with all the other events that have happened throughout history on November 19. THE DECEMBER TOUR: THURSDAY 10TH (the 314th). HOME GROUND! Travelling down the Fosse Way in the morning, I wondered what the support for this meeting would be like: the meeting in December is always a week earlier — would people remember- and how many people would be caught up in Christmas preparations. I needn't have worried — one of the best turn outs of the Year, with several newer faces intermingled with the regulars! On next to Moreton-in-Marsh (8). We were a little worried as to whether we would all fit in the belfry but with a lot of juggling we were all accommodated. These are a peal that definitely needs to be 'pushed' along to get the best out of them, and some good ringing resulted here with courses of Plain Bob, Stedman, Grandsire and the elusive Lincolnshire which had come to grief at Blockley. The last ring here was a very creditable course of Double Norwich. A last-minute change of venue for lunch saw the ringers at 'The Fox' at Broadwell: highly recommended for its speed of service, its efficiency and the quality of the food. A really good choice. Lunch over and on to Great Wolford, an easy-going 6, where we were able to ring some good changes of Plain Bob, London, Norwich, Stedman and St Clements. What fascinated us all here was the 'crib-board' used by locals for their call-changes, the unique rope guides and the completely plain walls devoid of any boards, notices, pictures etc which we are used to seeing in belfries. What thoughtful people the organisers were by choosing a ground floor ring as the last tower of the day — Todenham (6). Despite the seemingly long draught, the bells were easily managed and a pleasure to ring. Plain Bob, London, Wells, and St Clements were the chosen methods. As always people tend to drift home at the last tower but not before Isobel thoughtfully treated us all to Festive Mince pies! John thanked Isobel for organising such a successful day (no doubt ably helped by Keith) and for all her efforts throughout the year to coordinate the meetings and look after the finances. There are still outings to be organised for 2016 and no doubt Isobel would be delighted to hear from Volunteers! Wellesbourne, Warks, 5 Oct, 1264 Spliced Major (Plain, Little): 1 Chris Mew (C), 2 Simon Oram, 3 John Carroll, 4 Karen French, 5 Robert Reeves, 6 Richard Lewis-Skeath, 7 John Nicholls, 8 Peter Quinn. Rung to mark the 50th birthday of Noel French. Salford Priors, Warks,12 Oct, 1260 Erin Triples: 1 Richard Lewis-Skeath, 2 Mark Sayers, 3 Julie Doyle, 4 John Nicholls, 5 Simon Oram, 6 Michael Dane, 7 Chris Mew (C), 8 Peter Quinn. 1st in principle - 3, 5. Stratford-on-Avon, Warks, 25 Oct, 1280 Plain Bob Major: 1 Mark Sayers, 2 Will Jones, 3 Rosemary Hemmings, 4 Roger Hunt, 5 Matthew Kemble, 6 Michael Haynes, 7 Chris Povey, 8 Richard Lewis-Skeath (C). Rung to mark the 600th anniversary this day of the Battle of Agincourt. Also 25th wedding anniversary compliments to Charles and Ann Wilson. Bretforton, Worcs, 26 Oct, 1344 Superlative S Major: 1 Simon Oram, 2 Richard Lewis-Skeath, 3 Peter Quinn, 4 John Gwynne, 5 Steve Bowley, 6 Nick Allsopp, 7 John Nicholls, 8 Roger Hunt (C). A treat for the conductor on his birthday at his home tower. Bretforton, Worcs, 7 Nov, 50 mins Grandsire Triples: 1 Chris Povey,2 Jane Gilbert, 3 Lucy Gwynne, 4 Steve Bowley, 5 John Gwynne, 6 Richard Lewis-Skeath, 7 Roger Hunt (C), 8 Nick Allsopp. Half-muffled in remembrance of the fallen of two World Wars and rung prior to a Bretforton Silver Band concert in the church in aid of the Royal British Legion Poppy Appeal. Bretforton, Worcs, 11 Nov, 15 mins of Call Changes: 1 Roger Hunt (C), 2 Rob Davis, 3 Tony Shilham, 4 Alan Curry, 5 John Cleveland, 6 George Jelfs. Half-muffled for Armistice Day Assembly at Bretforton First School. Longborough, Glos, 13 Nov, 1260 Doubles (Stedman, Grandsire, Rev Canterbury, Plain, St Simon's St Martin's) 1 Richard Lewis-Skeath, 2 Roger Hunt, 3 Michael Probert, 4 Len Morley, 5 Alison T Merryweather-Clarke (C), 6 Stef Whittle. Rung wishing Anne Skeath, mother of 1, a very happy birthday. An S@S quarter peal. Pebworth, Worcs, 29 Nov, 1260 Minor (720 Cambridge S, 540 Plain Bob): 1 Roland Merrick, 2 Freda Cleaver, 3 Matthew Kemble, 4 Chris Povey, 5 Roger Hunt, 6 Martin Penny (C). For Evensong. Offenham, Worcs, 5 Dec, 1260 Doubles (Plain Bob, April Day, Grandsire): 1 Bob Topp, 2 Freda Cleaver, 3 Chris Povey, 4 Claire Penny, 5 Martin Penny (C), 6 Roland Merrick. 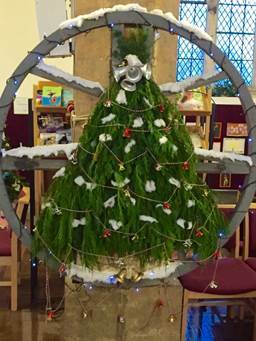 For the Christmas Tree Festival. Pebworth, Worcs, 24 Dec, 1260 Doubles (Grandsire, Plain): 1 Claire Penny, 2 Georgie Roberts, 3 Chris Povey, 4 Roland Merrick, 5 Martin Penny (C), 6 Claire Allen. For the Crib Service. Broadwell, Glos, 5 Dec, 1260 Doubles (Stedman, Plain Bob, Grandsire): 1 Rob Newman, 2 Steve Bowley, 3 Sue Bacon, 4 Richard Lewis-Skeath, 5 Roger Hunt (C), 6 Michael Chester. Wishing a speedy recovery to Christina Ireland of Evesham following a replacement hip procedure. Wellesbourne, Warks, 14 Dec, 1280 Spliced S Major (Cambridge, Superlative, Lincolnshire, Yorkshire): 1 Michael Dane, 2 Peter Quinn, 3 F Keddie, 4 Mark Sayers, 5 D Kempton, 6 Chris Mew (C), 7 John Nicholls, 8 Richard Lewis-Skeath. Great Comberton, Worcs, 19 Dec, 1260 Doubles (7m):1 Roger Hunt, 2 Steve Bowley, 3 Roy Williams (C), 4 Alison R Williams, 5 Richard Lewis-Skeath, 6 Stef Whittle. In thanksgiving for the life of Freda P Willgress, Alison's mother, who died 15 December, aged 78. Cropthorne, Worcs,19 Dec, 1260 Doubles (11m/v): 1 Steve Bowley, 2 Roy Williams (C), 3 Alison R Williams, 4 Richard Lewis-Skeath, 5 Roger H Hunt, 6 Stef Whittle. A wedding compliment to Emily Jones & Andrew Groom following their marriage at Fladbury earlier this afternoon. The band wish to associate Thelma James & Rob Newman with this quarter. Willersey, Glos, 31st Dec, 1260 Grandsire Doubles: 1 Stef Whittle, 2 Steve Bowley, 3 Richard Lewis-Skeath, 4 Sarah Chadburn, 5 Robert Chadburn (C), 6 Roger Hunt. Engagement compliment to Stef and Richard. Rung half-muffled in memory of William Beavington on the 100th anniversary of his death – killed in a major offensive of the Battle of Loos to take the Hoenzollern Redoubt, a key German stronghold. Rung half-muffled in memory of Oliver John Horn on the 100th anniversary of his death – killed in a major offensive of the Battle of Loos to take the Hoenzollern Redoubt, a key German stronghold. In memory of Sgt William James Harris, RAF, the sole fatality from The Wolfords in WW2, killed in action over France on 16th June 1940. Part of the 'Bells to Remember' quarters. The big news this time concerns three Guild members (see quarter peal at Wellesbourne, 23 Nov). They are Sophia Lewis-Skeath (now Mrs Sophia Stonehouse), Richard Lewis-Skeath and Stef Whittle. 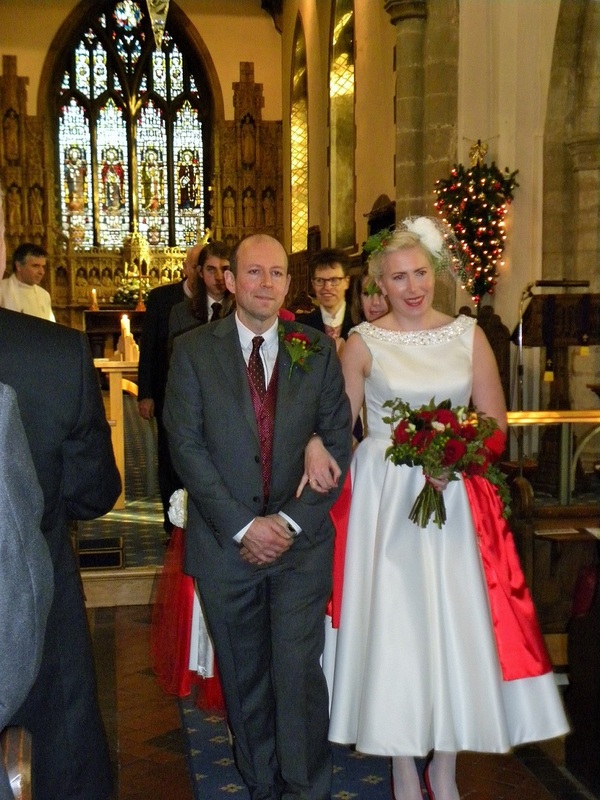 Sophia said 'Yes' to Ian Stonehouse, and she and Ian were married on 23rd December: see below. At much the same time as Sophia said 'Yes' to Ian, Richard popped a similar question to Stef, to which she also answered 'Yes'. All involved are supremely happy and I'm sure Guild members wish both couples very rosy futures together. The wedding: in spite of the windy and wet weather that has been the norm for December, the sun shone largely all day for Sophia and Ian's wedding at Holy Trinity Church, Barrow-upon-Soar, Leicestershire. 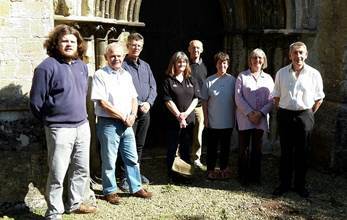 As expected it attracted a large number of ringers from the county (Ian is an accomplished ringer), FSG members and other ringers from as far away as Bath. A quarter peal was rung by some before the Service. Benjamin acted as Best Man to Ian, whereas Eliza was Sophia's bridesmaid. There was open ringing afterwards, plus a very well struck touch of Bob Minor of handbells by an experienced band. The reception was held in the Church Hall, which is attached to the Church. A nicely informal gathering occurred with drinks and seasonal nibbles. It was clearly a happy day for all concerned. Rung prior to the marriage at this Church of Sophia Lewis-Skeath and Ian Stonehouse, with congratulations from the band. Adlestrop: the faculty to proceed with the rehanging work was received on 10th December, so Adlestrop will soon have a light ring of 6, tenor about 5cwt. It will be all go in the tower now. 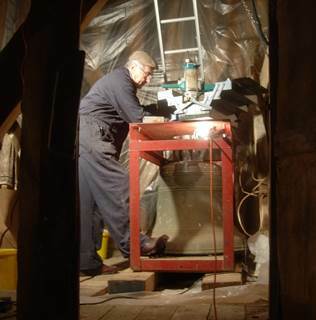 Due to the lack of bell-sized floor hatches and the church clock being under the bells, the bells and frame will be removed and replaced via a larger (and safer) roof hatch. The bell work will proceed in parallel with a project to repoint the tower, the necessary scaffolding being used for both purposes. Whitechapel Bell Foundry will remove as much as they can internally through the access hatches that do exist, but the major items will then wait for the scaffolding to be erected. More on progress in the next Newsletter. It's unlikely the bells will ring out for Easter, but a wedding is booked for June, so that's the target. For those of a nervous nature, the access to the Ringing Room is due to be altered, but not immediately. The PCC have plans to construct an internal porch, to stop the wind blowing up the nave on cold days. The roof of this porch will provide an upper floor from which to access the Ringing Room via a much shorter ladder. Access to the upper floor will be by steps at the side of the porch. This 'Phase 2' project is expected to be completed within 2 years. Adlestrop's redundant 2nd bell will be going to Pillerton Hersey to assist with that rehang. …… and another. Thank you, El Pres! It has become customary to conclude the year's activities with a Christmas Party. This year's party was held on 12th December in Badsey Church following a shortened practice there. Hilary and John Bolton invited us to use the community facilities the Church has now, and these suited very well indeed. 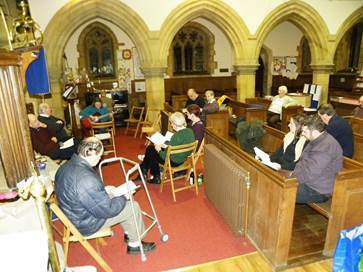 Twenty-two members attended. Food was plentiful (oh Bill, where were you to help clear up…?) and drinks were provided either by what members brought, or by teas and coffees served up via the Church’s domestic facilities. To finish this very pleasant evening, we sang a number of carols, accompanied by Steve Bowley on the piano and Sue Bacon with her guitar. The raffle and other donations made £59, which, after donating £25 to Badsey Church for the use of the venue, placed £34 into the Bell Restoration Fund. Our thanks to Hilary and John for encouraging us to this excellent venue; and to the PCC for allowing it. Badged clothing is available again, following the Committee's decision to change supplier (see Committee Notes). Matthew Kemble has taken over the management of this. Prices haven't been finalised yet, but the indication is they will be much the same as before. Most of the previous types of garments will be available, in most of the colours; and in most of the previous makes (eg Fruit of the Loom, etc). There will be a large advert for all this in the April Newsletter. If you want clothing (and many do apparently), contact Matthew who has more details. A section in the 'Around the Towers' part of the July Newsletter will be devoted to such ringing by Guild members. Also in April - the 23rd — is St George's Day. We ringers have been requested to celebrate this by ringing bells on the day. Please do so again. A section in the 'Around the Towers' part of the July Newsletter will report such ringing by Guild members. Guild lapel badges are available. It is slightly different to the previous version, as it is now the same as the clothing badges (the 'standard' Guild badge). It is slightly '3D' too, as some features are raised. £4 each from the Hon Sec. 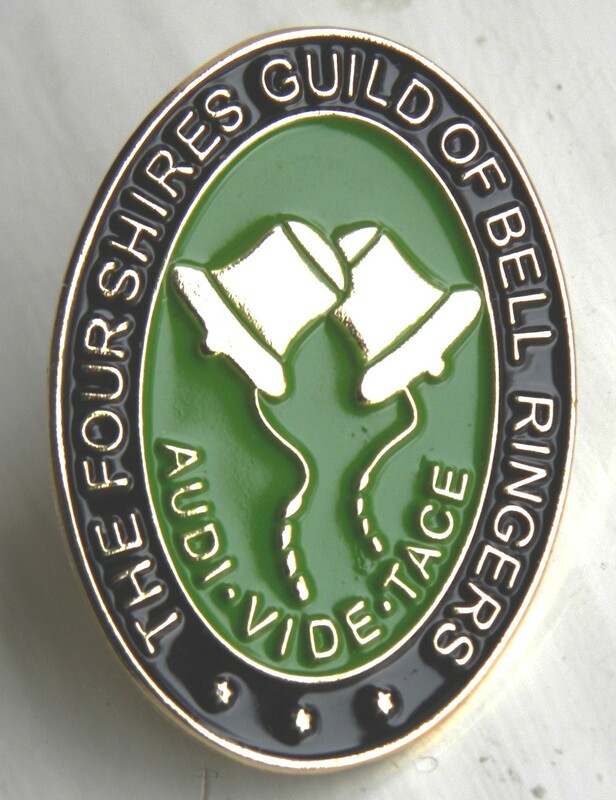 The Guild has a Bell Restoration Fund, from which the Committee are empowered to offer grants towards suitable aspects concerning rings of bells within the Guild's area of operation. Such aspects may include a range of needs, from maintenance to augmentations. Are you looking for a set of handbells to buy? If so, Peter Newing has a set he wishes to sell. He has 12 (1½ octaves), largest (if he remembers correctly) is F19 plus a C22. They are in a wooden carrying case and are in excellent condition. Peter says they are by a continental bellfounder who only made a few sets, so they are rare. Price is £2,100, may be negotiable. Contact Peter for more details. GRAHAM NABB OF THE KINETON RINGING CENTRE SENDS INFORMATION ABOUT A NEW BOOK ON RINGING PUBLISHED BY ART, (THE ASSOCIATION OF RINGING TEACHERS). Introduce your new ringers and interested members of the public to the world of bell ringing with the new 'Discover Bell Ringing' booklet published by the Association of Ringing Teachers. The booklet is the a new ART product to help those who are new to ringing understand something of the history and culture of the activity as well as answering some of the common how, where, why and when type questions that new ringers ask. Additionally, it also gives a taste of how new ringers can develop their interest in ringing. It may be provided to new ringers as well as being used for those showing an interest on tower open days or other such occasions. Neil Thomas says This book is just what the ringing world needs. Not the normal dull photographs but young ringers enjoying themselves, positively showing that bell ringing is for everyone. Facts are clearly made and illustrated. While covering the intricacy of change ringing it doesn't get too bogged down on any point. It is a book which should appeal to any prospective learner and leave them hankering to find out more. In easy language it gives information on the history of ringing, how bells are made and hung, what change ringing is and how it’s done, the stages of learning to ring, safety hints and a taste of who and why people ring. There is space to record a ringer’s first few towers and performances, information on tower and association details and guidance on where to find out more. This is part of an intended ‘pack’ for new ringers. 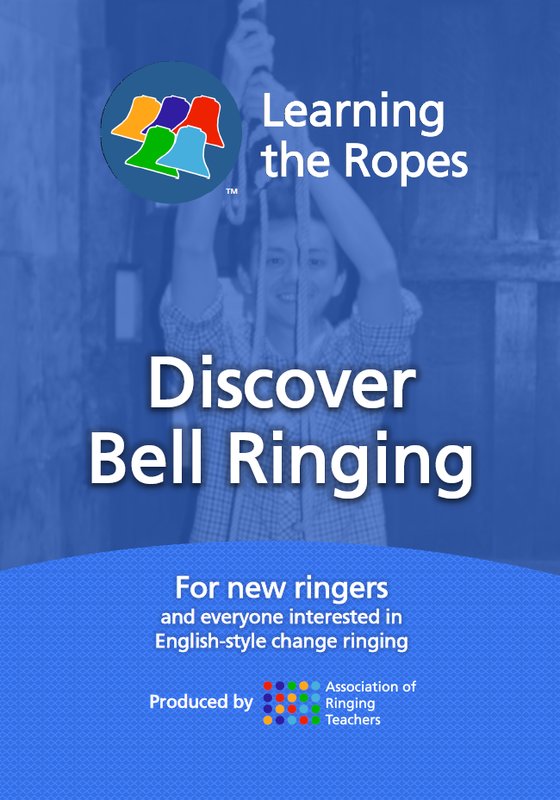 Teachers can add a ‘Learning the Ropes’ Logbook or other structured learning record for their ringer, perhaps more Association/Church information and even resources such as the ART ‘Bell Handling’ DVD. This booklet suitable for all new ringers is available for everyone to purchase from the ART Shop at www.ringingteachers.co.uk/shop. A single copy is priced at £4 - or save £1 per copy by buying a pack of 5 copies. The ART Shop accepts cheques, bank transfers and all major credit/debit cards through PayPal, plus every order includes free postage and packing. This booklet has been generously supported by AbelSim, which we thank for their contribution. For any alterations to this programme, check the Four Shires Guild web-site or Campanophile. The Calendar part of the FSG web-site gives further information about each Saturday night tower (just single-click the tower name), including a location map. Meetings are from 7.30pm until 9.00pm unless otherwise stated. All are welcome. You do not have to be a Four Shires Guild member and we are especially pleased if members of the local band wish to come along and ring. Please contribute something, however small (or large). You would be surprised the things people enjoy reading about.. They will all be welcome…. and don't worry if you think your handwriting is unintelligible. It can normally be translated. Just send the stuff in! It helps me hugely if you send articles to me by email, so I can cut-and-paste. If sending articles in this way, please use MS Word format for written articles, jpg format for photos, and scanned items in pdf or jpg formats. (I have the facility to scan photo prints if you haven't.) Please let me know ownership of photos for acknowledgement where relevant. If you have a long article, you might consider breaking it into parts. Ringing Tour Sat 2nd July, details to be announced. Minimus Striking Comp Sat 17th September, location and details to be announced. AGM & Striking Comps Sat 15th October, location and details to be announced. Guild Christmas Party Sat 10th December, location and details to be announced.